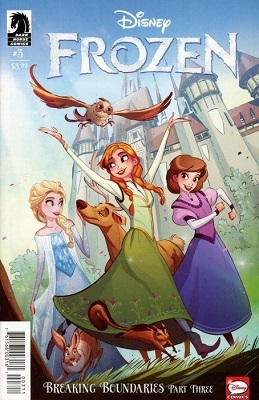 This book is in Disney Frozen: Breaking Boundaries. Anna and Mari's search for the perfect job suddenly has them working to save the day when they delve into the mystery of missing cargo. Meanwhile, animals from the forest have found their way to the village! Elsa must find a way to work with the neighboring kingdom and return the animals back to their woodland home . . .